Thanks you very much. That seems work perfect. With automation item start issue, it remains this issue. In this case, it's not an VST automation issue (automation smoothing), because there is no automation on any VST. The audio from some VST synth* (reasynth, for exemple) can produce the same issue than from an audio clip (previous issue) : audio glitch at AI start. With some VST synths, there is no issue. In this exemple, there is no plug-in automation. I have put an AI volume track on the parent track of the plug-in track. * V-Station (Novation), Attack (waldorf) and all u-he synths (Zebra2, TyrellN6, Hive, Diva, etc.). Last edited by ovnis; 01-16-2019 at 09:43 AM. This is huge you guys, thank you. Automating a noise vst (noise swells, special effects etc) was pretty much impossible because of the click. If this fixes it, we're back in bznz! It's pretty strange. 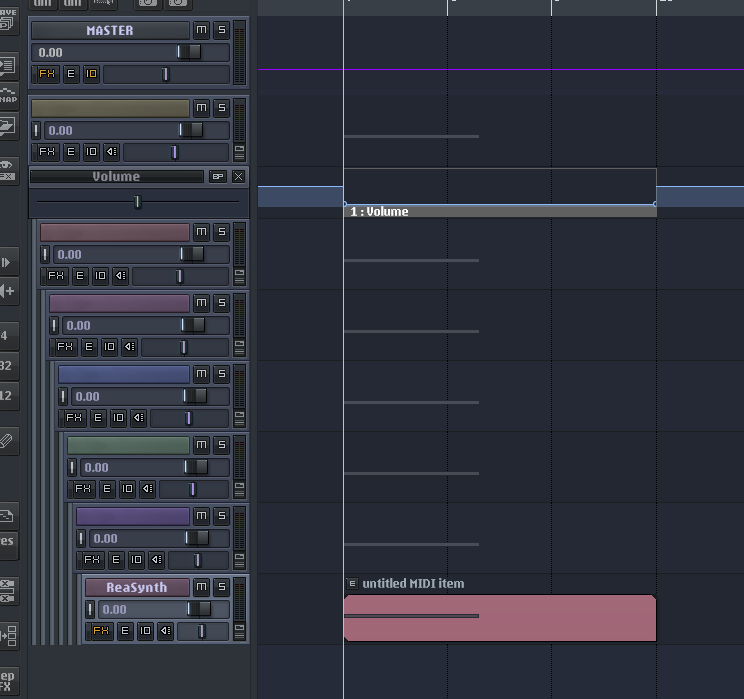 If I make "Apply track/take to items as a new take" on the midi item (reasynth), the created audio item (the midi take is not activated or deleted) + volume AI behave like the previous Reaper version : audio glitch at the AI start. Last edited by ovnis; 01-16-2019 at 05:06 PM. Thanks for attaching the project. With this project, I am not able to reproduce a glitch at the start of the automation item, when the automation item transition time is set to 0. If you are able to reproduce a glitch, could you save the project with the cursor in the exact right place to start playback, and let me know the audio buffer size? I try to investigate. The issue occurs with ASIO and WASAPI but not with DUMMY audio, Direct Sound, Waveout. My sound card : M-audio M-Track 2*2 (7.0.3509). 16 ms (my actual) or max buffer (4096) doesn't change the issue. Maybe your sound car is no setted on ASIO ? Click happens when there is an AI even if the volume of the AI is the same than the previous envelope. Click happens too, when all volume envelope are setted on - inf and there is an AI. Too, clicks can happen even when the volume of ReaSynth is -65 DB or the attack is 5000 ms. Strange : in this video, on the problematic track (where there is the AI), the volume meter shows nothing when the click happens. The issue appears to be inconsistant. After some manipulations in Reaper, there was no click with ASIO... But the issue has come back. Last edited by ovnis; 01-17-2019 at 09:40 AM. On fresh reaper portable, there is no issue with ASIO but with WASAPI. Same buffer sizes than previous : 512 ms with WASAPI. 16 ms with ASIO. On my current Reaper, if I disable Ozone 7 modules there is no click with ASIO and WASAPI. Last edited by ovnis; 01-17-2019 at 10:33 AM. Clicks with WASAPI but not with ASIO with Ozone 7 bridged (x86) and modules activated. If i disable Ozone modules, there is no click with WASAPI and ASIO. If I bypass or delete Ozone 7, there is no issue with ASIO and WASAPI. Last edited by ovnis; 01-17-2019 at 10:27 AM. Maybe is it an "request block size" issue ? Sorry for my previous answer about the buffer sizes. It was the m-track buffer size but not the Reaper buffer size ("request block size"). The buffer size on my usual Reaper is 128. Last edited by ovnis; 01-17-2019 at 10:55 AM. With Zebra2, there is click with ASIO, DirectSound and Waveout. With Dummy Audio, there is no click but the track master volume meter shows light. Last edited by ovnis; 01-17-2019 at 12:45 PM. Ovnis, I remember demoing Ozone, and there was always click in beginning of file when rendering a file in Reaper. If I removed Ozone from chain, click was gone. So I decided not to use Ozone. Try bypassing Ozone just to see if click is gone. Try bypassing Ozone just to see if click is gone. Even without Ozone, I have click. Whithout Ozone, I have click with Zebra2 and Reasynth. Plus, I can have no click with Ozone and Reasynth according the configuration! Last edited by ovnis; 01-17-2019 at 03:21 PM. the VST version of Ozone sat on my master drops the input signal (it's input - therefore output all quiet.) after a few seconds at a certain point. bypass it and everything is still there. VST3 version with the exact same settings is ok.
literally occurred after installing this version, problem free prior. fyi currently using a large buffer size ( 3000) as got a large project on another tab. edit: yeh this is nicht gut - large project with izo plugs all over the shop won't play. Last edited by BenK-msx; 01-17-2019 at 05:20 PM. Reaper's ability to open and close projects has become very slow off late. Its been happening for the past few releases. I can't put a finger on when it started happening exactly. But here is a demonstration of what exactly is happening. In the following video if you listen to it with audio..you will find my voice over telling exactly what the issue is. Like in the video even for a small project with just 3 audio tracks and 2 plugins in each track its very slow. This wasn't the case before. The video that you see is on a laptop with the below specs. But I am able to replicate this in all my Macs. Is it slow in the 5.965 release version too? If so, you should post this in the BR forum, and ideally you should try older releases and see in which version it changed. Maybe it happened started with Mojave? Also try dragging and dropping rather than opening via the open-project window? Maybe it'll show more what's going on. If you go back to +dev0115 does that fix? If not, +dev0112a? etc please let us know. Hi Justin, Thx for your speedy response. Just tried in 5.965 and yes..it is slow. But wow !! your idea of dragging and dropping from finder is as fast as how it used to be both on 5.965 and on the pre release. When I dragged and dropped from finder its perfect. But then again when I quit reaper with a project opened or close a project tab it is slow. I have been using Mojave ever since its been released I can be sure that this issue came up quite recently. I have a feeling that it started after performance tweaks came up in the video window. If you can remember which version it is..I can go back and check it on that. 5.965 does not have video performance tweaks, I don't think? So I am not sure then what has caused..Pls tell me how can I help you on this to narrow down the issue. But definitely dragging and dropping from finder makes it faster ! had left it as thought this version would resolve automation niggles. nothing would break if i went back to official for a bit would it?